Our Traditional Locking-Pin Buttons are printed at near photo quality and have a durable metal locking-pin backer. 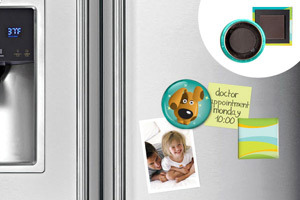 Our Magnet Buttons are printed at near photo quality and have a magnetic backer. 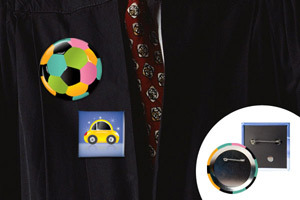 Our Mirror Buttons are printed at near photo quality and have a reflective mirror backer. Our Coaster Buttons are printed at near photo quality and have a cork non-slip backer. Our Keychain Buttons are printed at near photo quality and have two different backers. A series of vertical bars and spaces that represent any numerical series, most often a correct ZIP Code for the delivery address on a mailpiece. The barcode facilitates automated processing by barcode readers and scanners. A barcode also can be used to convey information for Delivery Confirmation and Signature Confirmation services. Barcodes that may be used for postal processing are POSTNET and UCC/EAN Code 128. We have two different batch sizes 28″ x 20″ or 40″ x 28″. Jobs with the same type and quantity are collected on the same batch. For example, all business cards and postcards 4/1 1k are collected and printed on the same batch. The finishing department, which performs operations on the printed product after it has been printed. The bindery operations are as follows: Folding, Binding, Stitching, Scoring, Perforation, Die Cutting, & Envelope Converting (currently done in house). – For Grand4mat Products, please see the G4mat FAQs for individual substrate guides. Booklets range from 8 to 52 pages printed on durable 100lb Book stock and are assembled in-house. An outline around graphics, text or edge of a sheet. Refers to the percent of light reflected back from a sheet of paper as measured by a light meter reading. Contrast is reduced and highlights are not as strong when paper with a lower brightness is used for a printed piece. Depending on paper brand the papers have different brightness grades, for example Tango has 91 brightness, Balboa ha 90 brightness. Standard Mail or Third Class Mail. Perfect for outdoor use, Bumper Stickers are printed on 3-mil premium white flexible vinyl film and coated with acrylic adhesive that’s laminated to a 90# layflat liner. The film is designed to accept a variety of solvent based and curable inks. The liner offers excellent product layflat, adhering easily to most bumpers and enabling them to withstand a variety of environmental conditions. So go ahead and hit the streets with your brand, full speed ahead! Paper coated on one side. We DO NOT print on C1S paper. The mixture of clay materials that are applied to paper to improve the smoothness of the paper’s surface and improve ink holdout during the printing process. Examples are Aqueous coating (AQ) and UV coating. UV coating adds a gloss finish to the product and also improves the vibrancy of the printed colors. Spot-UV can be applied to selected portions of the piece, while keeping the rest a matte finish. A service offered to mailers, service bureaus, and software vendors that improves the accuracy of matching to delivery point codes, ZIP+4 codes, 5-digit Zip Codes, and carrier route codes on mail piece. CASS provides a common platform to measure the quality of address matching software and to diagnose and correct software problems. An image, created by using color inks. Showing what the final printed product will look like. Color proofs are called Epson proofs tand are a 80%-85% match with the final product. Numbering a form, or a series of printed material where the number changes sequentially from one to another. Example, if the first one has number 201, the second will get 202, the third would be 203 and so on. A specific shape like circle, star, etc (any designs that cannot be done by a straight cut) which is cut by a metal blade. Door hangers are a popular product which requires die cutting. We can accomodate shape sizes 13″ x 10″ and smaller, larger sizes must be sent out to other binderies. Another name for advertising mail sent to targeted markets. It can be any mail class, but it is usually Standard Mail. Direct Mail postcards with UV on both sides. Available in 14pt and 16pt. You supply the mailing list and we’ll take care of the rest by digitally printing the names & addresses of your recipients on the product and applying a UV coating to both sides. NOTE: This Direct Mail product is for quantities of 1000 and below. A process of imprinting an image by applying pressure to the back side of a material to change the surface, giving it a three dimensional or raised effect. Embossing can be referred to as raised lettering. Operations to a document after it has been printed. The finishing operations could include bindery work such as, folding, trimming, binding, die cutting, inserting or any post press process that must be completed. A sheet which has been printed on only one side then folded twice in right angles to form a W-shaped four page uncut section. Standard Accordion folds are offered as 4-panels. For 5-panel Accordion fold jobs submit a custom estimate. Accordion folds are usually available on 100lb gloss book papers. Such as, brochures and catalogs. Single gate fold, with an additional fold on the center. A type of fold where the piece is folded in half and then folded in half again. The folds are parallel to each other. A sheet which has been printed on one side only and then folded twice at right angles to form a four page uncut section. A sheet is folded in half and then tri-folded. A coating on paper that provides a higher reflection of light, which results in a shiny appearance. Gloss coatings reduce ink absorption, which allows excellent contrast and color definition. Paper with a gloss finish, usually used for higher quality printing. Examples are 100lb gloss book, and 100lb gloss cover. A strip of paper containing gray tones ranging from white to black. So gray scale refers to black and white printed material. Printing on the front and back of a sheet so that the tops of each side are printed at opposite ends from each other. The top of one side is opposite the bottom of the other. You would turn the sheet over from top to bottom to read the reverse side. Also referred to as head-to-tail or tumble. The printing of new copy on a piece that is already printed. Examples of imprinting are ink-jetting addresses on postcards after the actual card has been printed. Please note that we DO NOT imprint or inkjet on any paper with AQ or UV Coating. The only job that can be imprinted after printing is spot UV jobs and any jobs in this category, which are as follows: Spot UV on both sides, UV one side no UV on the other side, Spot UV on one side no UV on the other side. These jobs do not get UV or AQ coating after imprinting. When a production process for a printed product is done within a facility and is not sent to an outsider, also referred to as in plant. A letter, card, or similar item placed inside another mail piece (host piece). A unique number assigned to a job by a buyer or manufacturer. The number allows the job to be tracked throughout production. Customers get job numbers automatically when they place an order online. Any orders that come in through mail or by customers drop off at the front desk get “walk-in” job numbers. We do our best to maintain the fidelity of your creative intent through the complex process of reproduction in print. While printing 200 lpi may be satisfactory, we have gone one huge step further with the adoption of Staccato (or FM) screening method that brings near photographic quality. Staccato eliminates halftone screen angles, rosettes, and screening moirÉ while preserving the desirable details in your artwork. Our Staccato screening process employs 20 micron dot size which is equivalent to 500 lpi. Printing an image over an area that has already been printed. In printing process colors, one process color is printed over another creating a secondary color, which is a combination of two primary colors. Sometimes in the files that customers send us there will be overprinting issues. Such as type or logos not printing. Customers should be aware that we do not check for this and their overprinting situation must be evaluated before sending the files to us. Please read our FAQs which provide info on how to avoid these and other issues. The quantity of items produced over the quantity that was originally ordered. Also referred to as any paper spoiled in the process of printing. For example if our batch is 1000 quantity batch we always overrun 150-200 sheets. Perfect Binding gives your booklets a more finished, refined look. A 10pt C1S cover (no coating) is bound with 80lb book (no coating) on the inside. The cover will be printed as 4:0 with the inside cover being blank and the inside of the booklet will be printed as 4:4. Perfect Bound Booklets are perfect for catalogs, manuals, presentations and proposals. Payment for delivery service that is affixed or imprinted to a mail piece, usually in the form of a postage stamp, permit imprint, or meter stamp. We offer different kinds of presentation folders, Inner pocket with round cut corner: (1 or 2, left & right pockets are optional) Inner pocket with straight cut corner: (1 or 2, left & right pockets are optional) Business card slit, left or right is also optional. The process by which a mailer groups mail by ZIP Code so that it is sorted to the finest extent required by the standards for the rate claimed. Generally, presort is performed sequentially, from the lowest (finest) level to the highest level, to those destinations specified by standard and is completed at each level before the next level is prepared. Not all presort levels are applicable to all mailings. A copy of the artwork representing the finished product. It is used for review and approval. 1. PDF proof. PDF proof is an electronic proof. We charge $5.00 to send the proof via email. 2. Epson Proof. Is a printed proof, which also called hard copy proof it is a 80%-85% match with the final printed product and it is sent through mail for the customer to approve before the job is printed. The person in charge of sending the proofs to the customer is the person who is processing the orders. Drilling of holes through a stack of paper. We use hole punching if a customer wants to have that on any printed piece. Applicable & popular sizes are 1/8″ & 5/16″. We can provide a different size, other than above mentioned, upon request. The additive primary colors, red, green and blue, used to display color in video monitors. Printing with a file in RGB color mode will produce a washed out appearance.That responsibility falls to the customer before submission of the files. Roll Labels are great for packaging and promotions. Use them on bottles, as warning labels, or for branding. With 2 different stock options, you will never run out of uses. Samples of a completed job (a small quantity of the actual job) can be requested to be shipped to your billing address when drop shipping to your customer. on 100lb book and 14pt stock. Score in half, is the most popular. A method of wrapping packages or products with a plastic film and then applying heat so that the wrap fits tight to the product. Shrink-wrapping is used to package a product in specific quantities and is also used for protection purposes. It also adds some stability to the product when storing. Also referred to as plastic wrapping. We do not offer shrink-wrapping. A slit can also refer to cuts made that do not divide a sheet. For example, on a presentation folder smaller diagonal slits can be made on the pockets where business cards can then be displayed. Printing with one or more solid colors, generally black ink is used with the addition of other colors. It is used to add highlight and add color to a printed product without having to print with four-color process. 1.To assemble and combine film or negatives to produce the final film for plate making. This process is now done electronically by many companies, bypassing the manual process altogether. 2. In reference to labels it is the removal of the matrix or waste material from around a pressure sensitive label after it has been die cut. For tax to be exempt on all orders, a valid and applicable resale certificate form is required. A state tax license does not qualify as a resale certificate. California does not accept resale certificates issued by other states. Please check with your tax adviser for additional information and clarification. The accumulated time between receipt of an order and completion of the finished product. Most printers offer different types of turnaround depending on the product, we have Next Day, 2-4 days, 5-7 days and 7-9 business days turnaround. The part of the spectrum where the wavelength of light is shorter than the wavelength of visible light.